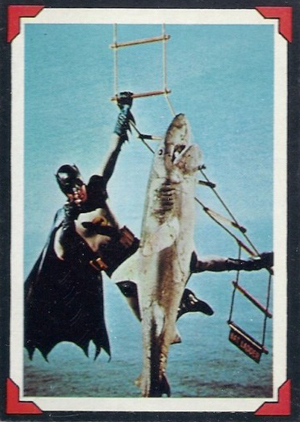 Topps didn't limit their Batman sets in 1966 to comics and illustrations. They also made two live-action sets. 1966 Topps Batman Riddler Back is based on the Batman movie that was an offshoot of the wildly popular TV show. The set gets its name for a series of riddles found on the card backs. 1966 Topps Batman Riddler Back card fronts resemble an old photo album. Images are cast against a black background. The photos have a small white border and the corners have red tabs. There are no captions or other text on the front. With photos from the film, a lot of the images are odd and outlandish. Fans wouldn't expect anything less. Besides Batman and Robin, the Joker, Catwoman, the Penguin and the Riddler are among those appearing in the set. Card backs are also predominantly black. Vertically arranged, the top half has both a caption and a blurb. The card number is in the top corner of the card inside of a Batman logo. The bottom half of the card has a riddle. The solution requires a decoder that came in packs. An illustration of the Riddler accompanies it. 1966 Topps Batman Riddler Back has a small 38-card checklist. The decoders are also popular with collectors. I have 11 of the 1966 batman black bat but the backs are blank, why would this be? I can’t find anyone to tell me why the backs are blank. I’m not a collector or a dealer. Can you help me? Are they vintage? What are they worth? Thanks in advance for any consideration. I have a NM-M set of the Batman riddler backs, with Decoder. I wonder how much I could get for them. NOT on EBAY, because they have cheapened everything so much that it is ridiculous,. 1966 TOPPS SCANLENS ORIGINAL BATMAN RED "A" CARDS - LOT 1 SIX CARDS EXC-NM COND.